Santa Cruz is known as a bit of an artsy town and with that comes a lot of interesting local coffee shops, from the spacious to the quaint, the standard to the quirky, we offer a little bit of everything when you’re looking for your caffeine fix. Hera are five of the best local spots to grab a cup of coffee and relax, get some work done, or visit with friends. Lulu’s Cafe (Octagon) – Lulu’s “Octagon” cafe is in the in front of the Museum of Art & History. In addition to serving tea, coffee, and espresso, they regularly have art exhibits on display and are often involved in the First Friday art tours. It’s a great place to stop by for a quick cup before you head to the museum or go for a stroll through downtown. Verve Coffee Roasters – Verve has several locations in & around Santa Cruz, including downtown and in the Seabright neighborhood, both of which allow dogs. The downtown location is significantly larger inside, offering patrons a place to read, study, work, or just enjoy a fresh cup of joe. The Seabright location is significantly smaller on the inside, offering only outdoor seating. It’s also located close to Seabright State Beach and some good dining options on Seabright Ave.
Santa Cruz Coffee Roasting – In business since 1978, Santa Cruz Coffee Roasting is a long-established local business in the heart of downtown Santa Cruz. They use a small batch roasting process and have an strong commitment to fair trade coffee to help promote ethical practices within the industry. Firefly Coffee House – Firefly is a small coffee house on Front St., near where it merges with Pacific Ave. toward the beach side of downtown. Sitting across form Kaiser Permanente arena, it’s one of the few spots on the far end of downtown where you can grab a decent cup of coffee. They also serve bagels and breakfast sandwiches. Cafe Pergolesi – Cafe Pergolesi is a coffee house that’s in an old converted VIctorian house on Cedar St. near downtown. it’s got plenty of quirk and charm, with small and large rooms, nooks and crannies, and plenty of outdoor seating on the deck. You’ll often find Pergolesi (or “Perg”) is crowded with college students and young locals reading or working on their computers. 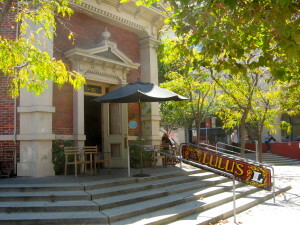 The cafe also serves beer and has a small food selection. The Abbey – The Abbey is an art, coffee and music lounge that is attached to and owned by the Vintage Faith Church. If you’re looking for that hip, relaxed coffee shop atmosphere with students and local professionals tapping away at their laptops, this is it. It is hands down one of the best public works spots in town and they’ve got plenty of caffeinated beverages to keep you moving. 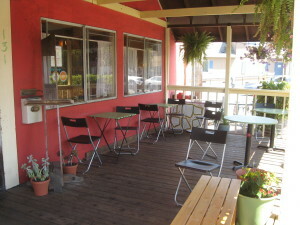 They offer both indoor and outdoor seating, as well as weekly live events.